Or, at least that’s what Pamela Geller says. 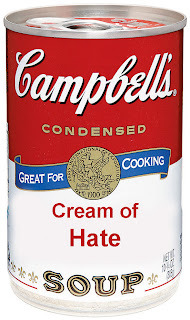 Indeed, the cuntservative hatemonger blogger is outraged that the Campbell’s Soup Company recently has agreed to label some of its products “halal”, the term used to indicate that food has been prepared in accordance with Islamic law. 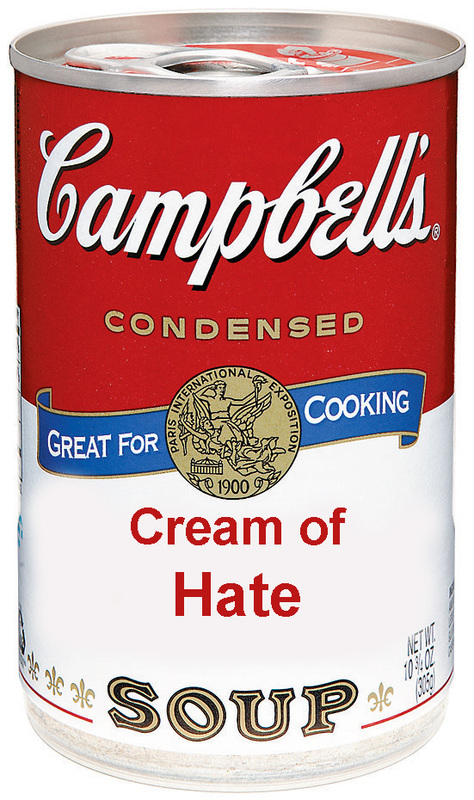 In response to the new labeling, Geller has called for a boycott of the Campbell Soup Company, a movement she believes will make Americans safer, and not just by lowering the level of sodium in their diets. Because I know whenever I slurp down a bowl of Chicken and Stars, I want to raise my spoon to Allah and launch a jihad—I mean, doesn’t everyone? Tsaritsa, she has, and 3100+ have joined the Boycott Campbell's Soup page. Because soup is hella evil.